fine water: Is this a prank? What's next -Sage C-Axis Carp rods? Orvis Flourocarbon Carp Leaders? Abel Super Series Carp reels? We certainly hope so. You certainly hope so? Are you guys fly fishermen...or not? The fish has to be pretty and have spots and be as dumb as a 3rd grader (trout) for you to get excited! What I would like to know is why you are not getting all twisted up about the other fly lines Rio makes? Pike line. Redfish line? Tell me how redfish are better as a sport fish then carp? Have you ever stalked the flats sight casting to 10 to 30 pound tailing fish with a 5wt? Does that NOT sound like a good time to you? 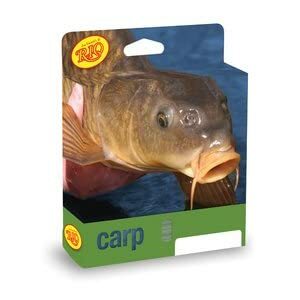 Oh, and btw...Able does offer a reel with carp scale graphics. Don't knock it 'till ya try it, guys. Carp are (by far) the most intelligent and most challenging fresh water fish. Far more deserving of a "specialty" line than your average trout. Broaden your horizons, brothers! It can be a ton of fun! Whoa there big fella. I think maybe that post was misunderstood. We are extremely pro-carp and most of our trip reports involve stalking tailing carp. I would rather fish for carp than anything else. When I say that I "certainly hope so", I mean that I hope that carp fly rods, carp leaders, etc. are next to follow the carp fly line. I definitely agree that carp are the most intelligent and most challenging fish and that's I fish for them almost to the exclusion of all else. Asking if the line was "a prank" was a tongue-in-cheek poke at the anti-carp anglers out there. Sorry that wasn't clear. Ah, brother! I have been picked on too much by trout fisherman. I'm all sensitive. Sorry for being a tool. Unfortunately I am pretty sure they discontinued this line this year. Or at least I heard that they were going to. The taper was custom made for your kinda carp Ty! Jay meet Ty. Ty meet Jay. As far as I can tell you even frequent the same kinda water (shallow mud flats)! Yeah, I'm an idiot. That is what I get for staying up late and coming into the shop hungover... Missed the point. Good to meet you, Ty. Love your stuff. Again...I'm an idiot. McT...I was down your way the other day. How is the Denver carpin' this summer? Haha..no worries Jay. I've had a few hangovers like that myself. That tongue-in-cheek part wasn't as clear as I meant it to be anyway, so my bad. Dang, Mctage, that's a bummer about that line being discontinued. I'm going try and track one down. Just the other day I bought my first carp vest. It's just like a regular trout fishing vest, but it stinks and the pockets are full of slime. Really nice. I mean, if you're into carp that is. Maybe carp fishing is too hard for us trout fishermen. My catch rates are low enough with trout. I don't need more days of wearing the skunk. Owl - i think you got robbed my friend. No self respecting carper would get caught dead in a vest, let alone one without the pre-packaged fermented algae scum in the front left breast pocket. With shopping skills like that you better stick to trout! Love carp more than anything. But a carp line: money-sucking. Maybe cool. But not needed. I like the box though. Hey Owl, You'll get kinda used to wearing the skunk if you start fly fishing for carp. Goes with the territory. Heck, after awhile you'll get to where you like getting a good skunk on. And McTage is right the vest. I'm hear you Wendy, but I just want to down to the fly shop here and make a scene because they don't carry the Rio carp line. And yeah, that box is pretty dang cool. Wow I came for the post and stayed for the following comments. You carp fellas are wild cats :) I still have yet to chase carp on the fly, but that's mainly because I live right next to a trout stream and not a mud flat. If it has a tail and swims in the water, I am all over it. Even thinking about chasing the poor old "Dogfish". Sorry I know they are not the best of friends with Carp :) Tight Lines. Hey Magee, Definitely don't want to get a bunch of carp anglers all riled up. We're the One Percenters of the fly fishing world. Hope you get chance to give these great fish a go sometime. It's for me not the best carp line. Give me RIO's Indicator line any day. You all know how to cast well, an easy delivery can be made by simply checking the cast a bit if you think it necessary. I want a line that loads quickly and helps with an indicator. That Orange tip helps me locate the end of it in terrible glare. I have a wonderful trout stream 400 yd. in the same city park where I fish most, not hard to figure out where I'll be. Gregg, great point about checking the cast. I often check the cast to turn the fly over when I'm using long leaders. That's a great little trick. Uh, in case I was not clear, the CARP fishing is 1/4 mile from a trout water with wild, and sometimes very large, browns and rainbows. I am with my large scaled pals when at the park. Trout do make it to the canal/pond complex we fish, and every year at least 1 3lb. plus 'bow has taken one of our sunk bread flies. Nice plus, I guess. Hmmmmm, sounds like a good place to make an interesting trifecta on the same trip - carp, brown, rainbow.